Those aware of the gaming world (and even some outsiders) will know of Mario, the Italian pumber who does a lot more jumping on turtles than unblocking toilets, from a long running series of successful titles for gaming giant Nintendo. He’s taken on a lot of things in his time (including a giant spiny shelled lizard that keeps stealing the local royalty and even a sun) and back in 2007 took on an entire galaxy’s worth of baddies in “Super Mario Galaxy” on the Wii. 3 years later Nintendo have shot him back into space to do some more galaxy-busting, is it better the second time around? The game starts with the same premise just about every Mario game begins with, Bowser kidnaps Princess Peach and nicked the grand stars that power the ship of the adorable star shaped Lumas, who help Mario to get the stars and the princess back. The game isn’t exactly huge on plot (preferring to focus more on gameplay) and you don’t need to have played the first game to understand what’s going on, which makes it very accessible. Speaking of accessible, Nintendo have gone to large lengths this time to make sure everyone can get in on the act. This includes bundling a DVD with the game (in Japan and Europe) that explains the basics of playing the game along with some more advanced tips. It even brings back the Super Guide from New Super Mario Bros that’ll complete levels for you if you die too many times (though it gives you a fake star for doing this). The DVD feels like an excessive step to try and include new gamers, but latter sections do recall some neat tricks. The Super Guide can be useful for new and older players for dealing with tough sections or levels too. The other nice thing about the guide is it’ll show up even at checkpoints, sparing you from watching the computer do the sections you already passed. This helpfulness even extends into the game itself, which hands out extra lives like candy at times. With all that in mind it’s understandable there is concern that maybe Galaxy 2 will be a watered down sequel for the masses. But in reality, the extra lives and help are handed out because you’re going to need it. The first world starts off pretty easy and serves as a means of easing players in along with a refresher for others, but Galaxy 2 gets into its stride quite quickly and starts throwing harder scenarios at players a lot sooner than the first game did. For example, Flip-Swap Galaxy is one of the first optional galaxies and features panels that switch when Mario spins. The level gets pretty fiendish as it goes along, adding moving electric fences between jumps and chain-chomps. The game really can require some smart thinking on the player’s part at times and while it provides plenty of lives and checkpoints to help, it still tries earnestly to show the player whose boss. The game plays a lot like the original, Mario is pretty much the same as before and a lot of popular aspects from the first game return such as the star bits and the bee-suit power-up. However this time Mario’s trusty dinosaur steed, Yoshi, has now tagged along for the ride and his brother Luigi gets into the act much sooner. Yoshi is a welcome addition due to his speed and willingness to eat just about everything, this includes some new fruit power ups that give Yoshi a super-speed boost or transform him into a large deflating balloon. In addition Yoshi controls a lot better than his last appearance in “Super Mario Sunshine” with a less likely tendency to slip into things and use of the pointer to make eating easy without putting Yoshi directly in harm’s way. Luigi is also less slippery than before (though he still slips a little) and can jump further than Mario, once you find him he becomes an optional character that can replace Mario at the start of select levels. The levels themselves all feel very fresh and new, while a lot do borrow concepts from the first game and usual Mario conventions, most levels have the same level of inventive thinking that the first had. Nothing beats that smug feeling of figuring out a puzzling or difficult section of a level. The hub of the game is different to that of the first, the various sections are now travelled to on a map like in older Mario titles and the hub itself exists as a rest area to move the plot along or provide extra lives. The good thing about this is it cuts out the need to run and jump around to reach various sections and saves a lot of time. The hub also has a lot more added activity as the game progresses, adding various characters and areas over time. The game also adds “comet medals “, one for each Galaxy which when collected speed up the rate at which the comet challenges appear. These challenges range from slightly tricky to nail bitingly hard as they did before but more daring gamers can tackle these much sooner rather than waiting till much later in the game. Overall, Mario Galaxy continues the innovative level and item use of the first and shows that clearly the first game just wasn’t enough to contain all the ideas Nintendo had the first time around. As a result it’s a very welcome return to space, even if it’s tough as nails at times. Older players will appreciate the inclusion of characters like Yoshi and ramped up difficulty while newer players benefit from an extended help system (though it remains to be seen if this does indeed ease new gamers into the world of Mario). 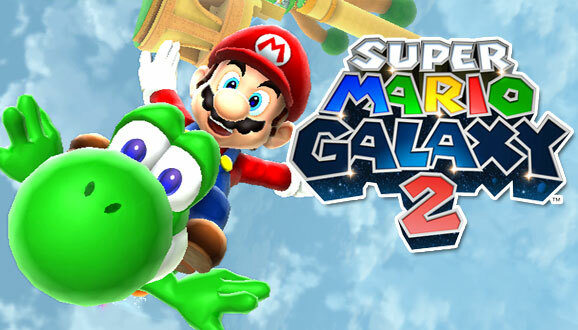 Overall Super Mario Galaxy 2 is the first game again and then some, considering how good the first was, it’s great to be soaring through the Galaxies with Mario again.